App update! This time, we’ve added a bunch of features requested by the Raptr community! First on the list, One-Click-Join! If you have a friend playing one of the games we support, and you have the game too, you can check out all of the server info as well as join them with one click. Server is full? Just keep spamming that refresh button until it clears up (that’s what I do!). 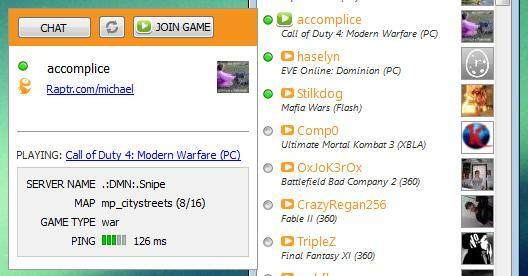 We even have a nice little green arrow to show that you can join him/her. Next is the triumphant return of Facebook Chat. We had it in the app a while back, but removed it because of instability. NOTE: Enter in your Facebook USERNAME, not email. 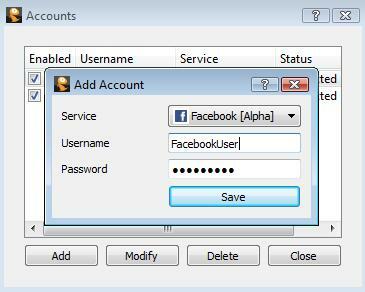 You can find your username by going to your Facebook settings. Finally, for all of you that are ashamed that you play Farmville and Zoo World, we’ve added the feature to stop tracking Flash and Facebook games. Well, that’s it for this release! Feel free to contact us with questions/requests/comments! « Previous PostHow Did They Do? Mass Effect 2 and BioShock 2 Next Post »App Update: In-Game, File Transfer, And More!